Paddle Tasmania will be conducting a Beginner Whitewater Packrafting Course with daytrips based out of Hobart over the weekend of the 16th and 17th February. Practical sessions will be conducted during the day plus a theory session on the Saturday evening. The course will conclude Sunday afternoon (approximately 3:30pm) either from near the Tahune Air Walk (approximately 1.5 hours drive from Hobart) or near New Norfolk (approx. 40 minutes from Hobart). The course will be led by Paddle Australia Advanced Whitewater Instructors with a maximum ratio of 1:6. The main instructors are Dan Hall and Mark Oates with additional whitewater instructors involved if required. The course is suited to complete novices and those who already paddle grade 2 whitewater. The focus of this course is on developing safety and technical knowledge specific to packrafts being used on grade 2 whitewater and is an ideal foundation for those aspiring to learn to paddle grade 3 safely & competently. There will number of in-water practical components and all participants should be prepared for sessions involving capsizes plus swimming and wading in moving water (wetsuits are recommended or drysuits if available). 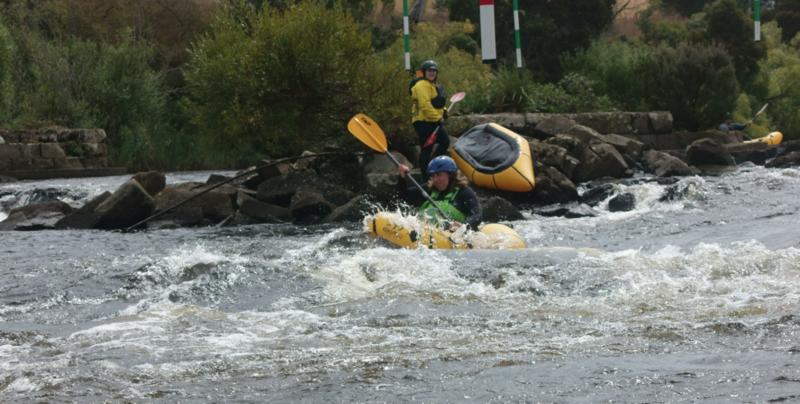 This course provides the foundation for both the Intermediate Whitewater and Advanced courses and is recommended prior to undertaking an Intermediate Course. Starting Time & Venue: Saturday 16h Feb 8.15 am – Meet at the Banjos Bakery in New Norfolk at 8:15 am to grab a coffee/snack/lunch before the official start at 8:30 am. From there we will drive out together to the starting location, 10 minutes further north. If any issues with meeting the group at Banjos by 8:30 am then contact the course organiser, Mark Oates on 0409194260. Evening Session: Saturday 16th Feb 7:30 pm to 9:00 pm – Meet at The Hutchins School Power of 9 Campus which is located next to the Hobart Royal Yacht Club on Marieville Esplanade, Sandy Bay. This is the rounded-roof building immediately to the north of the main Hobart RYC building. Sunday 17th Feb: The location for day two depends on both river levels and the group. It may well take place near New Norfolk but on a more challenging section of the Derwent or it may involve a downriver trip on the Picton River near Geeveston and the Tahune Air Walk. You can register for the waitlist if you are interested. If someone is unable to make the course the first person on the waitlist will be contacted. Please do not forward any payment at this time.